aqueduct with complete preserved stratigraphy have been retrieved, but also important water-consuming structures. Valencia is also a unique example of the reparation of Roman water supply systems in the Umayyad period. 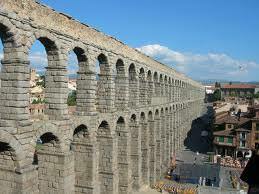 Rome was famous for its aqueducts, and the Romans were renowned for their hydraulic engineering. The construction of aqueducts was something so clearly Roman that it is difficult to imagine these lofty-arched structures in any other time period. But these were too big and too useful to be simply destroyed once the Roman Empire had fallen, and still it is difficult to imagine a medieval city with an aqueduct. This seeming nonsense is the main focus of my doctoral research, in which I try to identify those aqueducts that continue to function into the Visigothic period and beyond, reasoning why this happened and how it affected late antique urbanism. When I was offered to contribute to the first issue of Arkeogazte.